You know, I’ve blogged about bathrooms before and I’ve talked about claw foot tubs too. But I’ve never focused on bathroom vanities and I think it’s time to feature them. 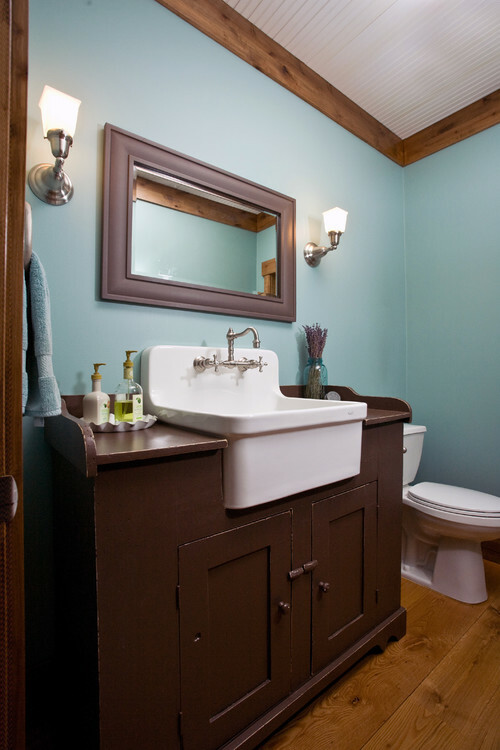 I’m sharing a collection of bathroom vanities in a variety of styles. 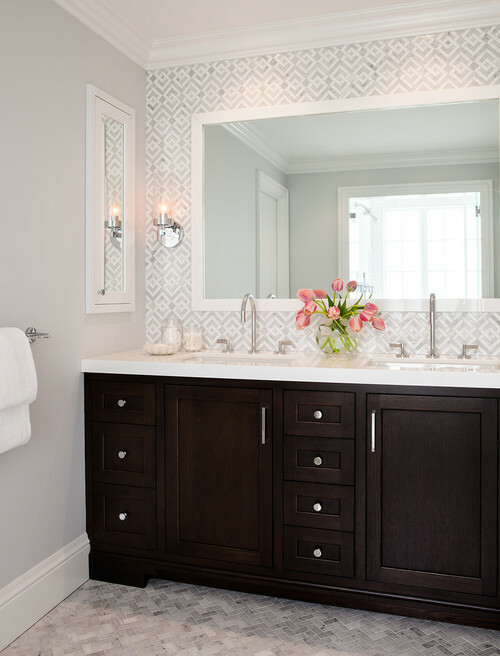 Bathrooms and kitchens can make or break the deal when it comes to buying or selling a home and changing your vanity is a great way to update your bathroom. I’m lovin’ this light gray one with its marble counter top. Sometimes bathroom vanities become part of custom cabinetry that expands an entire wall. 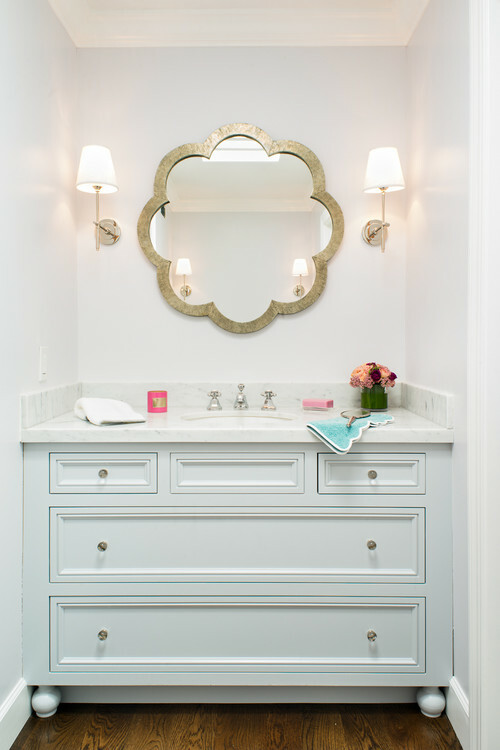 This all-white vanity with custom trim is spectacular. 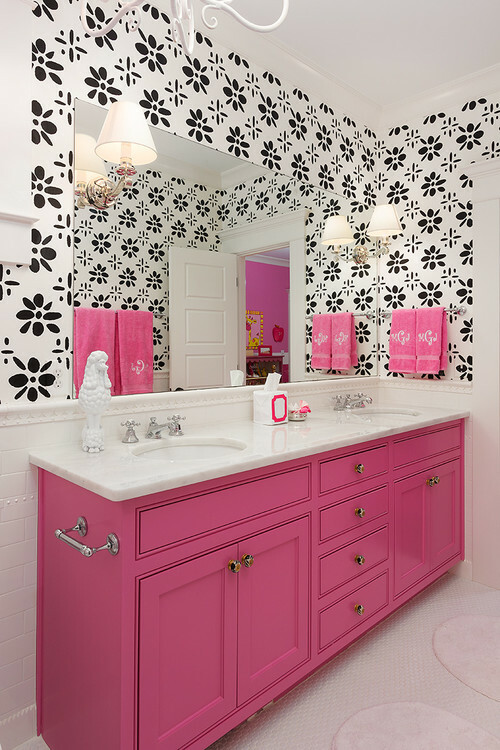 My daughter wants to upgrade her powder room with a pink and gray color scheme. This bathroom made me think of her. I don’t think she’s swapping out her pedestal sink for a vanity with storage, but I’m anxious to help her give the tiny bathroom a makeover. Farmhouse bathroom vanities are worthy of Joanna Gaines’ stamp of approval. I love unique sinks and when they have vintage appeal like this one, they’re even better. 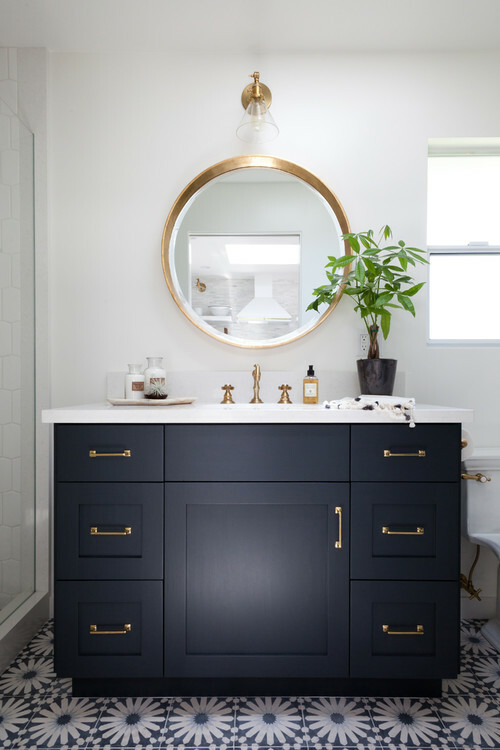 A beautiful navy blue vanity is paired with brushed gold fixtures and hardware. I love the simple elegance of this bathroom. I don’t know what I love most about this bathroom … the subway tile, the rich wood ceiling, that amazing shower fixture, or the industrial style vanity. 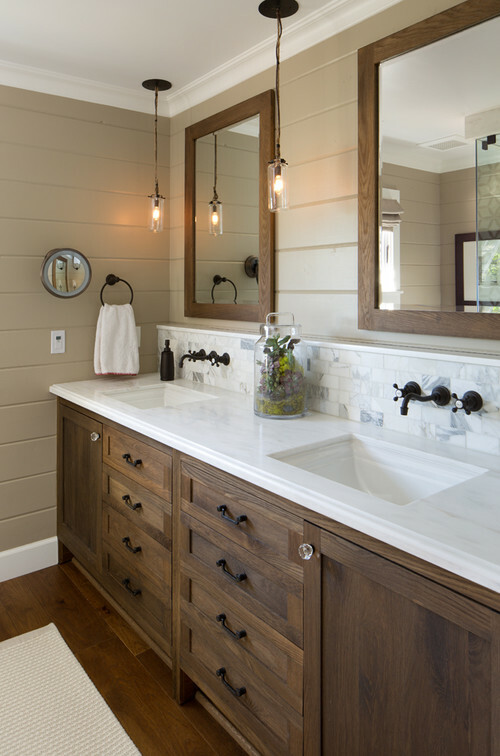 Shiplap walls, simple pendant lighting, and rich wood come together to create a harmonious farmhouse bathroom. This corner of a quaint and charming bathroom makes great use of space. 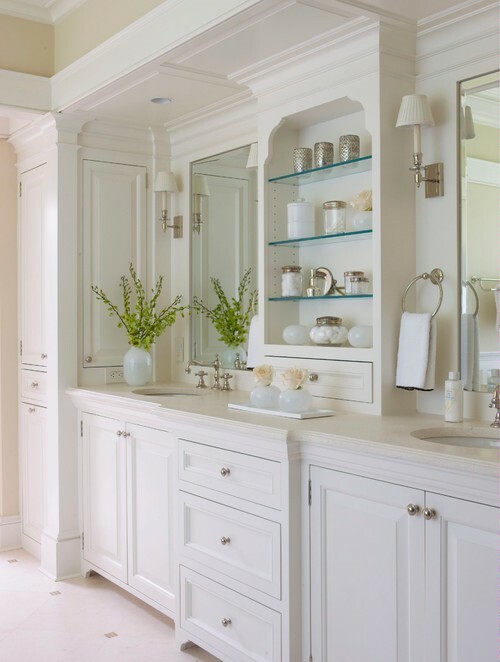 The scalloped mirror adds an air of femininity while the ball feet on the bathroom vanity lend cottage appeal. Normally I like light and bright spaces, but lately I’ve been drawn to rich woods like you see in this bathroom with its pale gray walls. One papered wall adds visual interest with a soft and subtle pattern. The pairing of light and dark creates a bit of drama in any room. 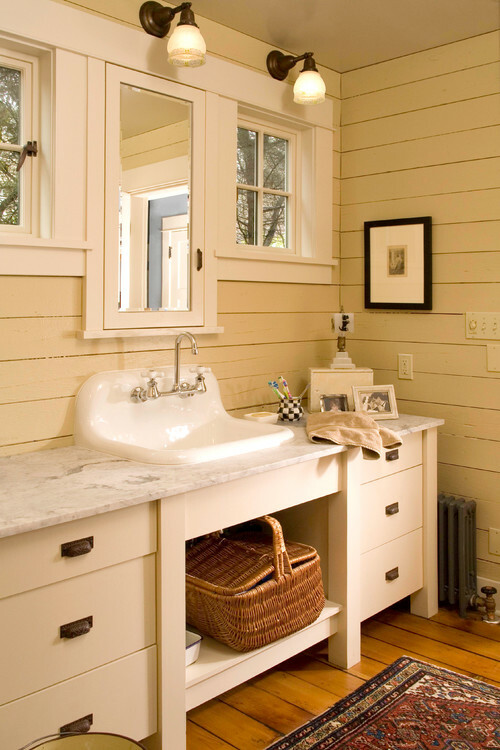 Finally, we’ll end with one more dark vanity, this one with oodles of vintage farmhouse charm. 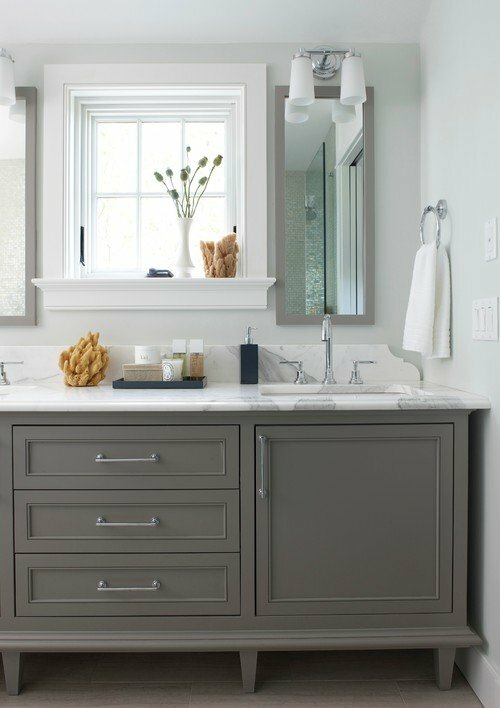 Of the ten bathroom vanities featured here, do you find you have a favorite? I like the farmhouse style. It has been a few years back i saw where someone had just a pine wood cabinet with a huge stone for the top,it was really neat. It would take a lot to find just the right stone with an indention for the sink. I would have to say the Anne Snead bathroom was my favorite. The one with a wall of cabinets was very nice, and the farmhouse yellow was excellent, but that one was more my style . I’m drooling over the vintage farmhouse vanity! !